This afternoon the 14-0 Toronto Wolfpack took on the 1-13 Hemel Stags from the south of England. A Wolfpack record 7,247 fans came out to the Den at Lamport Stadium to cheer on the Wolfpack in their final regular season game. Wolfpack captain Craig Hall scores a try worth 4 points. Hall is also responsible for kicking all the 2 point conversion attempts after a try. He split the uprights on this kick from a difficult angle. The She-Wolves put on a few performances. The She-Wolves keep the energy going during the game too. The Wolfpack led 32-10 at the half. Some second half action. At the final horn, the Wolfpack downed the Stags 74-16 to end the season undefeated. Teena and I on a beautiful sunny afternoon. The players all shake hands and hug afterwards. The fans love all of it. The playoffs are done differently in this league than in North America. Now that the regular season is over, the top 8 teams (16 in the league) play in what is called the Super-eights. It is a round robin where everybody plays each other once. The first place team after the round then earns an automatic promotion to the next level for the following season. (The league has three levels, League 1, Championship league and Super League). The teams that finish second to fifth then playoff to see who earns the right to the second promotion. The undefeated Wolfpack obviously qualified for the Super-eights and hopefully will earn promotion after the eights directly o the next level, the Championship League for next season. Teena and I stood above the player exit after the game. This player will have a nice shiner tomorrow. Players love it. Even the visitors as they are all welcomed by the fans after. Many join in for drinks in the craft beer garden. The pizza, though, will be cooled down as it takes a long while for the players to make their way around the field meeting fans and posing for pictures. There was a cheer from the crowd when this players shirt came off. Another favorite of mine and most Pack fans, Fuifui Moimoi. The beer garden stays open after the game, so the party continues. 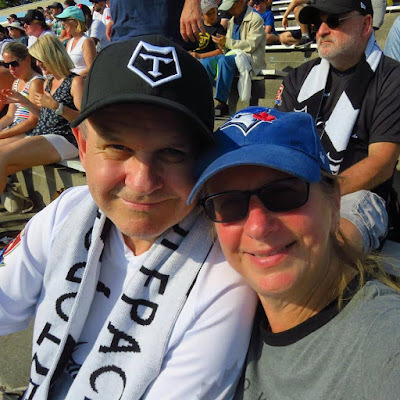 As the Wolfpack ended up first in the league, they get to host 4 of their 7 Super-eight games which will be played at Lamport on August 19, and consecutive Saturdays in September, 2-9-and 16. Teena and I will be there!